The Santa Monica, UCLA Medical Center has added Teach Back for Fall Prevention to our Teach Back patient education tool box. Teach Back helps care providers confirm that patients understand what they are being taught. Using Teach Back around fall prevention education and patient safety is one more way we are working to improve our patient outcomes at SMUCLA. Teach back is an evidence based method of patient education that we use every day at UCLA Health. Fall prevention is particularly important for hospitalized patients who are in an unfamiliar environment, on medications, and are in a weakened state. Both patients and bedside visitors must be educated about fall prevention and the need to call for assistance before attempting to get a patient out of bed. Discuss the fall risk with the patient and family and explain why they are at risk of falling. Ask if the patient has fallen before. Explain that they cannot get up without assistance and educate about using the call light. 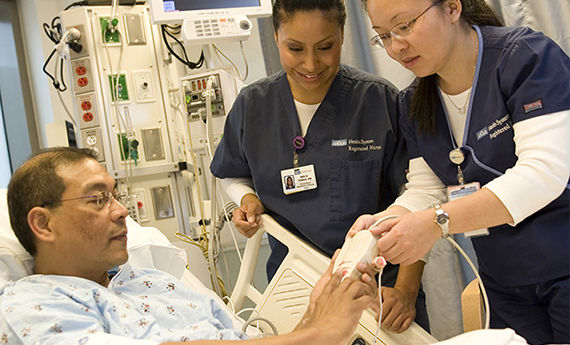 Show how to use the call bell and have the patient perform a return demonstration. Make sure they have the call bell every time you exit the room. Explain hourly rounding to the patient so that they know that someone will be coming in to assist them routinely. Explain that the bed and chair alarms, which are used for their safety, cannot be turned off. Discuss and implement frequent toileting, if applicable. After educating the patient about their risk of falling use Teach Back to have the patient and or visitor tell you back what you have discussed. The care provider who is performing the teaching takes responsibility for providing clear and understandable information. When using Teach Back the care provider says "Just so that I know that I did a good job discussing your fall risk with you can you tell me back what we just discussed about fall prevention as if you were teaching a family member or friend?" This statement lets the patient know that he is not being tested, but it is the care provider's effectiveness that is being assessed. **Remember to document all patient education in the electronic health record and include Teach Back as the method of teaching used. **Please individualize each care plan.